Sotha Sil's realm is completely synthetic and as a result of the soil being completely metallic real vegetation cannot grow there. 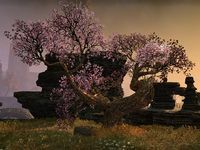 Sotha Sil has created various types of metallic vegetation that mimic real ones found on Nirn and they include Cherry Blossoms, Oak, Maple, Spruce, Cyprus, and other types of Flora such as shrubs. Fennel has several clumps of tiny yellow flowers and finely dissected leaves. 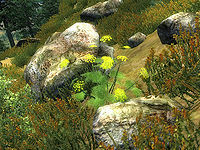 It is most common in the northern part of the Gold Coast Region of Cyrodiil. 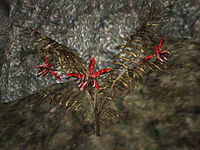 The Fire Fern is a perennial herb native to Morrowind. 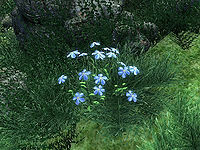 Their evergreen foliage and flowers are resistant to the conditions of high heat found in Vvardenfell. They grow primarily on Red Mountain, in Molag Amur, and on Azura's Coast. 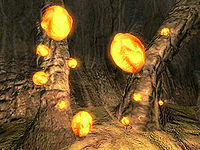 Flame Stalks are a semi-rare plant native to the Shivering Isles, it grows primarily on the sides of cave supports in the Mania region. Flax have thin stems and many small leaves that flower with either a pale pink, yellow, or blue head. 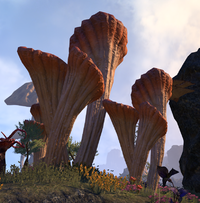 It can be found across Tamriel, although it grows widely in the West Weald region of Cyrodiil. It is mainly used in the production of linen, although its seeds can be of use to alchemists. 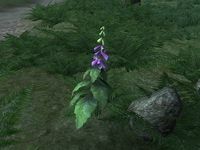 Flint Vine is a sturdy vine often found growing in caves or the ancient Xanmeers of Murkmire. Possessing strong fibers, this plant can be used to weave ropes or ladders that can hold the weight of an adult mortal in a pinch. Fly Amanitas are easily recognized mushrooms, distinguished by their white-spotted deep red caps. They grow in vast numbers in Cyrodiil's Great Forest and in many of the province's cities. They can also be found underground in Skyrim's caves. Foxglove flower on tall stems. They are easily noticed due to their light-purple tubular heads. A species of blue flower that only grows in snowbound regions. It can be found near the Seven Thousand Steps, and has curative properties. 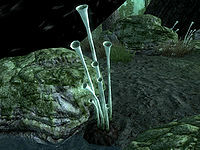 Fungus stalks are small tube-like biota found growing in the Dementia region of the Shivering Isles. 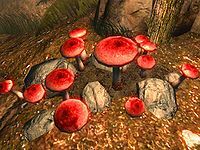 Funnel Cap Mushrooms can be found growing in Vvardenfell. ^ Frostheart Blossom item description. This page was last modified on 9 January 2019, at 02:42.